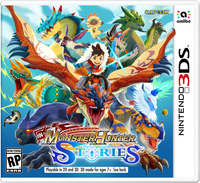 After releasing the Nintendo 3DS spin-off Monster Hunter Stories for smartphone devices in Japan last December, it seems Capcom has seen fit to allow those in the west have a taste of this well-received title. In a bit of a surprise release, the game is now available for iOS and Android devices for those willing to try out this turn-based RPG for themselves - for a price of $19.99. Of course, if you're not willing to shell out the money quite yet until you know what exactly you're getting into, you're in luck. Capcom is also offering a free demo called "Monster Hunter Stories: The Adventure Begins" that serves as a separate app you can download. Better yet, you will be able to transfer your saved data to the full version so you can pick up where you left off. You can also download this through the iOS App Store or the Android Google Play store. - Fight with yourMonsties in Network Battles! Take your hero and theMonsties you've raised into battles with other Riders! Build a team of your favorites to challenge other players. The egg hatches, revealing a baby Rathalos, a flying wyvern also known as "the King of the Skies." The trio affectionatelyname him "Ratha," and take him back to the village.